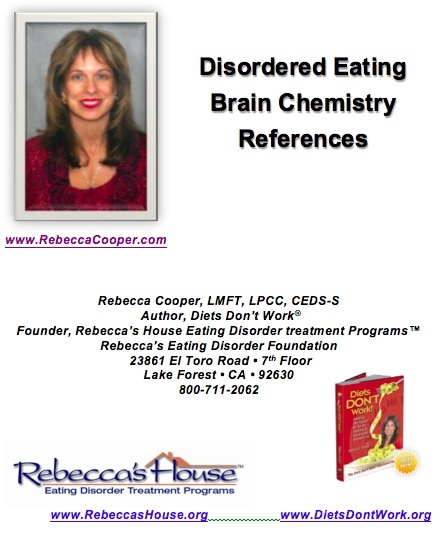 Home / Posts tagged "diets"
Rebecca Cooper is recognized for her methods, advocacy, and years of helping people with eating disorders at Rebecca’s House. Her methods are outlined in her book Diets Don’t Work. I am in recovery with my eating disorder and…I’ll never have to go back. The tools…your program has given me are priceless. I will (and have) recommend your program. I could not have experienced the freedom I feel today without the guidance, professionalism, the teachings, the understanding and the compassion of our common bond. I have hope today. I have courage. I am a different person. I awoke with an uneasy feeling today. I stated thinking about my trip here. My last thought was about the plane ride here. Someone needed medical assistance on the plane about an hour into the 10-hour flight from Atlanta. The person was lying on the galley floor about ten feet from where I was sitting. The flight attendants were asking for a medical doctor to come forward. She repeated the request several times while the other attendants rushed for the oxygen tank and first aid kit. I thought there must be a doctor on board. Then they started asking for nurses or anyone with medical training. The attendant sounded desperate. I wondered if people were afraid to get involved because they might get sued. Please God don’t let that be the reason. Finally three people came forward. All I could see was a group on people huddled around the person lying on the floor. Finally they dispersed, but I never saw the person or learned what happened to him or her. Then I started thinking about my arrival in Buenos Aries. I had a bad experience with the taxi cab driver from the airport. I have not talked to anyone about it. It is very hard to communicate here in English. The translations in the conferences are about the only proficient English I have found. When I talked to my husband I told him I had an interesting cab ride and I would tell him about it when I got home. I didn’t want to worry him. I tried to put the cab incident out of my head because I don’t like to focus on the negative. I also had some positive things to think about, especially feeling so honored and excited to speaking at The World Mental Health Congress. 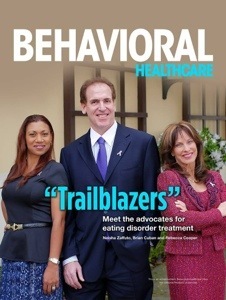 What an opportunity to help other professionals understand more about the treatment of eating disorders. I was not going to allow that experience to ruin my trip. But today I awoke feeling fear. I tried to examine where this feeling was coming from. I wondered if it was about Ruth that I am supposed to meet this morning. She responded to one of my Facebook or LinkedIn comments I had posted about being at the conference. She said she was attending too. She works with local patients with eating disorders too and would like to meet me. I gave her my itinerary and said I could only meet her today or Friday before I leave. I have learned to pay attention to my intuition, but was that the reasons for this feeling or was it about my first experience in Argentina? The cab driver spoke very little English, but finally conveyed that the road at the hotel was closed for a festival and stopped the cab about 8 blocks from the hotel. He told me the fare, which was higher than I had been told. He then was trying to help me convert the fare to US dollars. He grabbed 2 one-hundred-dollar bills he saw in my wallet. I told him to give it back. He tried to give me 2 one-dollar bills, but I told him I knew that he took 2 one-hundred-dollar bills. He then gave me 1 hundred-dollar bill and a one-dollar bill, arguing all the time in loud Spanish. I stood my ground and he finally reached onto the floor like he must have dropped it and gave me the other one-hundred-dollar bill. He then showed me he had 2 twenty US dollars and asked for the 1 hundred-dollar bill and he would give me $40 in change. We exchanged money and he took my bags out of the cab and placed them onto the curb. It was a desolated area. It was early in the morning and the shops along the street were boarded up. He pointed in a direction and left. I took my bags and started walking. In a few blocks I found a person and showed him my hotel reservation and he pointed in a direction. I walked till I found another person and he pointed and I walked, then another. When I got to the hotel taxis where pulling up in front of the hotel. I haven’t felt like using my eating disorder in decades, but I also refuse to set in these uncomfortable feeling. Maybe that is one of the reasons for my long-term recovery.